Applying stage makeup is an art, distinct from both regular makeup wear and makeup for the screen. 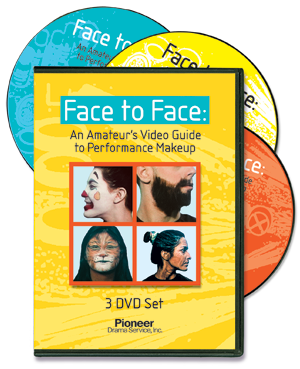 These books, along with our detailed how-to DVD, provide step-by-step instructions to create authentic and realistic looks for any time period. You’ll also find help to make-up fantasy characters and animals. Through these great resources full of beautiful color pictures, you can even learn how to enhance the magic of theater by drastically changing physical features with facial hair and wigs, bald caps, nose putty, latex skin wrinkling, scars and more. Pioneer Drama Service is pleased to offer 2 texts and DVDs in this category.